The San Jose Blog: The San Jose Blog's 4 Year Anniversary!!!! The San Jose Blog's 4 Year Anniversary!!!! It's amazing how time goes by. The very first post on The San Jose Blog was four years ago today. That was over 1,500 posts ago. The original mission was simple, show the world that San Jose is a really cool city and deserves a lot more respect than it has been given in the past, both from outsiders and even residents themselves. 2009 was not a great year. Financial markets were dry, real estate was depressed, unemployment was at a 26-year high, and just about every major project in San Jose was either on-hold or cancelled. 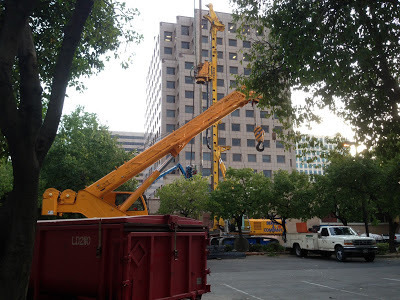 If you looked at the very core of San Jose, the Downtown residential high-rises were selling at an abysmal rate, and there was little hope that any of the dozen or so planned towers would move forward. Yet, there was still reason to be optimistic. The masses slowly started caring. A culture based around innovation and constant improvement began emerging. Communities of people excited with every new potential San Jose project popped up. The Usuals opened up shop and started selling I "Heart" SJ shirts, and people actually put them on. San Jose started getting ranked on National Top 10 lists: #1 Top Job Market in the US, #1 Happiest City of Young Professionals, #1 City for Patent Creation, #1 Highest Median Household Income, #1 Top Cleantech City in the US, #1 Healthiest City for Women, #1 Safest Large City in the US, #1 Highest Salaries for [Fill in the Blank], etc., etc. etc. Of all the stats, perhaps the one I was most proud of was getting technically and objectively ranked as a "World Class" City for the first time ever. Thanks to David Cheung for the photo. Also read this and this. ONE SOUTH MARKET BROKE GROUND!!! San Jose is getting a new tower! There will be some sort of TSJB celebration and I will be buying the first round of beers. More details on this soon. In parting, I would just like to say a huge thanks to Jen, Jarrod, and Alvin for their contributions to this blog over the years; you guys area amazing! Also a heartfelt thanks to all the readers out there for stopping by, for believing in San Jose, and contributing to its future successes. Our city is a better place because of people that believe making a difference is possible. Even something as small as shopping at a local vendor can have a big impact. Happy Friday! Congratulations, Josh & everyone! I pop in here daily for the best-of-the-best SJ news. You have the perfect filter for what you post, and the positive angle (not spin!) you and fellow posters take on the joys of living in SJ; specifically downtown. Thanks all and keep up the good work! And go downtown, go! I've lived downtown 13 years now and I can't believe how much it has changed. 4 years already?! Time flies when your having fun. Soon to be added to your list "Cisco Field in downtown San Jose, home to your San Jose Athletics!" Keep the faith, it will happen! Hope you are right Anthony. It's what I live for! The only reason why I didn't add it to the list is because we are in the same place as four years ago =). I really hope to see this as well, it's only a matter of time before San Jose gets a MLB team! Get it together Bud, make the smart choice and let the A's come to San Jose! Happy Anniversary to the SJB! It's a lot of fun to be part of this local blog. Thanks for all the posts and keeping us updated, Josh! And a great big thanks to all our readers both here on the blog and to those following us on Facebook, Twitter, and Instagram (where I hang out and manage more so than here on the blog) -- you are all awesome! Happy Anniversary and thanks for all the great blog posts. I started reading this blog when I lived abroad to keep afloat of the things going on in San Jose (and to alleviate some homesickness). Now I read every post because I'm back in San Jose and you guys do a great job of informing us about the community. Keep up the great work everyone, and congrats! Happy Anniversary Josh, & fellow bloggers! This blog has been a great place to read about, and brag about a place we are very proud about -- San Jose. BTW, just a little heads up: A new local brewery called Santa Clara Valley Brewing just got started and according to a recent interview with the owner, they would like to establish their permanent brewing facilities and tasting room near DTSJ. Really looking forward to this possibility. While this is good news indeed, I wonder if the guy wearing the "SF" hat realizes the Giants don't want the A's in downtown San Jose? MLB downtown would be a complete boon to his brewing business. I'll give him the benefit of the doubt on his choice of ball cap. Go A's and Go San Jose!! Oh yeah, I am definitely aware of this. Downtown is going be a beer connoisseur's dream within a couple years... Original Gravity, Good Karma, ISO:Beers, Market Beer Co., Whole Foods Brewery, and now this. I haven't posted about SCVB yet because we may be getting a new blogger that will specialize in beer and do the intro =). By the way, there is also a new Beer Coop in San Jose and there is a good chance it could be located Downtown. Thanks so much Josh for keeping this thing so alive. You are doing a great job! I haven't heard any more about the illumination under I-87. Anything? Don't have much news other than it is still planned for this year. Looking forward to seeing this as well as the other major public art projects that are being planned.